Easy to find pub with fantastic views across the harbour and to the hills beyond. A good varying range of beers which might include a beer from the Skye brewery. We had an excellent pint of 'Red Cuillin' and apparently they do get the odd Shepherd Neame brew brought up all the way from Kent. The lounge bar is rather small and does fill up so get there early if you want a window seat offering fine views across Loch Broom. They do a good range of lunchtime snacks including venison burgers, and have a restaurant (no smoking) that is open in the evenings. 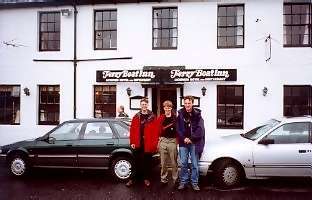 Local CAMRA Country Pub of the Year 2000.